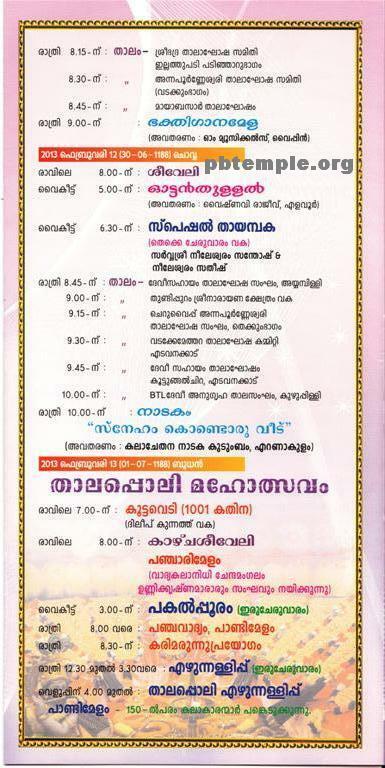 ‘Special Niramala’ and ‘Chuttu Vilakku’ during all days of ‘Mandalam season’. 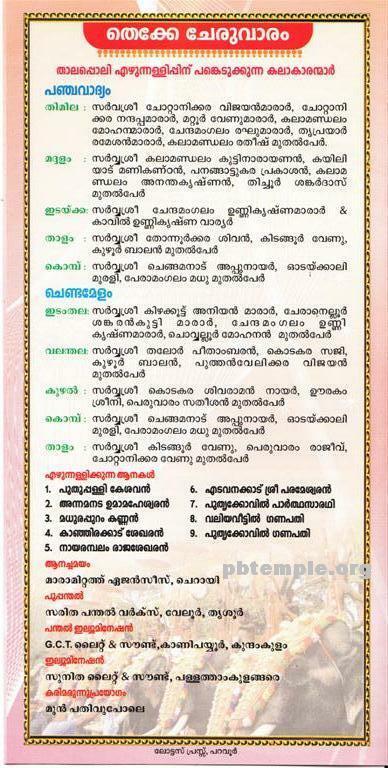 Bhagavatha Sapthaham, Navaham, Sivapuranam etc. ‘Padayani’ literally means ‘joining for the battle’ is a ritual observed in connection with the ‘Thalappoli Mahothsavam’ in remembrance of the ‘Dharika’s fort in flames. It is performed at about 4 am in the day of ‘Bharani’. Dry palm leaves tied and erected like poles around the temple premises will be set in flames with the beating of drums then, the half burned poles collected together in front of the temple to form a great flare. "Thookkam" is one of the most celebrated rituals observed on Kumba-Bharani day at Pallathamkulangara Bhagavathi Temple. 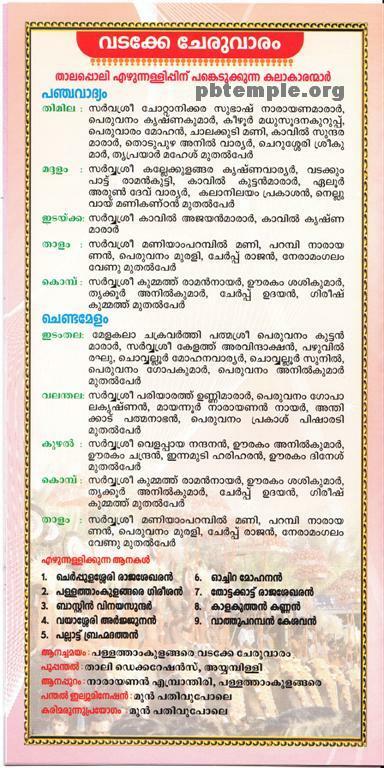 It is yet another special ritual observed in connection with the ‘Thalappoli Mahothsavam’. The ritual of Thookkam starts after the lowering of the holy festival flag, ‘Aarattu’ and ‘Bharani Sadya’ (the mass fest on ‘Bharani’ day). It is observed in remembrance of the incident of ‘Dharika Vadha’ (killing of Dharika). The legend of ‘Dharika Vadha’ is as follows: Brahmma pleased by Dharika Asura’s “Thapas” gave him a “Varam” that he shall be killed only by a young lady. Shielded by it Dharika called Devas to battle, fearing defeat they approached Siva, seeking help. The arrogance of Dharika invited Siva’s rage. Siva opened his Third Eye; out of which, Badhra-Kaali was born. Kaali Maa eliminated Dharika in a fierce battle. But, even after eliminating Dharika, Kali maa was in rage, as a matter of fact no one was able to cool Kali maa anger successfully. Devas and the sages approached Siva for help Siva ordered Ganeshawara and Nandhikesha to tackle the situation. So, they disguised in the form of infants positioned themselves in the path of Kali maa. When Kali maa saw the infants on her way, Her temper vanished into thin air. Out of maternal love She carried the infants up and kept them close to Her bosom. Hence, in commemoration of Kaali’s victory (Dharma) over Dharika (Adharma) “the Bharani day” is celebrated. Generally, "Thookkam" are of 3 kinds- 1) the "Aal Thookkam", 2) the "Garudan Thookkam" & 3) the "Mayilpeely Thookkam" Here it is ‘Aal Thookkam’ and its variants “Pillia Thookam”, which are performed. In the Bharani day at about 5.30 in the evening, a man, crowned, dressed in red cloths, painted in different colours on face and with a sword and a shield in his hand is fastened (with ropes made of long piece of clothes) to the top end of ‘Thookachadu’ (a long and straight piece of wood like a pole, with a square portion at the top end fixed to a wooden frame) would be hoisted up and carried by men three times around the temple premises. When Thookam comes in front of the temple, babies and small children will be given in the hands of the Thookakaran (the man performing Thookam) this is known as Pillia Thookam. ‘Thookkam’ is observed in commemoration of Dharika’s death in the hands of Kali maa and Pillia Thookam in remembrance of the incident, Kali maa lifting up the infants. 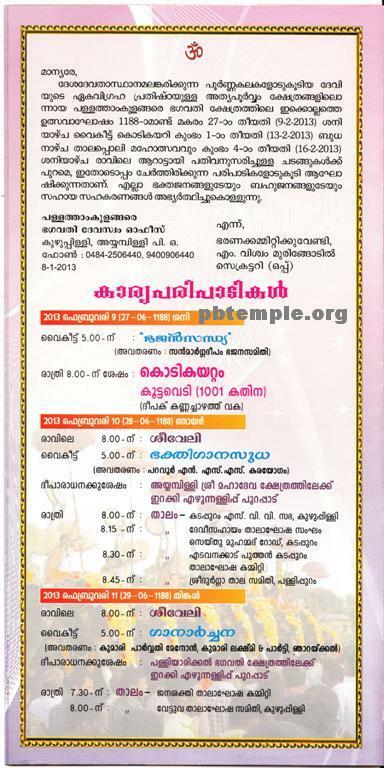 After the ‘Thookkam’ the doors of the ‘Sreekovil’ will be closed at about 6.30 pm. Temple remains closed for six days there after.